When you learn Algebra 1 in higher class you will find that real word problems are more difficult. There are more steps to find the solution. You have already studied systems of inequalities. Here we will discuss System linear inequalities word problems. Step 1 : Read the question properly. Step 2 : Check the inequalities given in the question. Step 3 : According to the inequality, make an inequations. step 4: Change the given equation in slope intercept form. Step 5 : Graph the each line While graphing check the origin test and then mark each region. Step 6 : Intersecting region is the solution. Write an inequality for each of the following . 1)Fuel from petrol pump A costs 3 per gallon and from petrol pump B costs 5 per gallon. Mr.S have at most 20 to spend on fuel. Write and graph a system of linear inequalities. Mr. S have at most 20. As both x and y are greater than zero so zero is included. The 4th center graph represents the solution region. Any coordinates from that region satisfies the inequality. Such as (3,2) ,(2,2) etc. 2) Anita works as a online tutor for $\$ $4 per hour. She also works as a editor for $\$ $7 per hour. She is only allowed to work 15 hours per week. She wants to make at most $\$ $75. 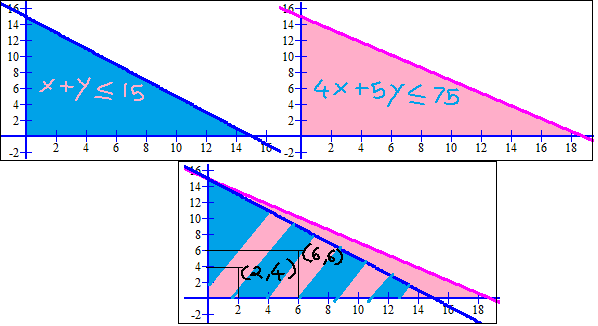 Graph a system of inequalities to represent this situation and write at least two solutions. Solution: Let works as a online tutor = x and as an editor be y. The center graph represents the intersecting region. The coordinates (2,4) and (6,6) satisfies the inequalities.